We love Little Tikes products in our home. Our kids have a great time with them and my husband and I love how durable they are! So when we were recently given the chance to review one of their new iTikes products I was thrilled and I knew our oldest boy would love it! We recently purchased an iPad and it is a special treat when he gets to use it. 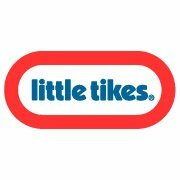 iTikes is a line of Little Tikes toys that can be used with your iPad, and some work with your iPod touch or iPhone. We were sent the iTikes Canvas which works exclusively with your iPad. Within 5 minutes of opening the box this was set up and ready to use. We simply downloaded the free app onto our iPad and put batteries into the Canvas. Our 4 yr old was so excited that he was getting to use the iPad! The Canvas is super easy to use, our little guy had it figured out quickly and loves it! We were actually supposed to go visit my parents the evening this arrived, which he typically begs to do, but I had a hard time prying him away from this toy to get him out of the house. Finally he put it down, but as soon as we got back home he wanted to play it again before going to bed. There are two different games on the Canvas, a matching game and a game where your child can play catch with a dog named Mitts. I honestly thought that with just the two games he would quickly become bored, but that is the furthest thing from what actually happened! He has loved playing memory card games since he was about 2 so the memory game on this is very fun for him as well. The iTikes Canvas is a toy that I really enjoy our son playing because the memory game, well obviously works on teaching him how to pay attention to detail and remembering where things are, and the catch game teaches him problem solving. The Canvas can also be used to create artwork. You can start a picture from scratch or even color a picture that has already been created! Your child can add "stickers" to his artwork as well. My son loves this and he will always say "Look at the picture I made for you!" , and then the best part for me as a mom is I can then save the artwork onto the device to go back and enjoy later. 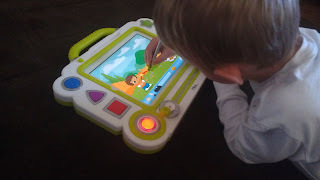 Lastly, another great feature is this can be used just like a regular magnetic doodler without the iPad, when it is used like this our 20 month old is able to enjoy the toy as well. So it really is a toy that can be used for so many age ranges in a variety of ways! This is a toy that is getting a lot of use in our home and we all give it a big thumbs up! You can purchase this toy for just $39.99 and one of you will win one of your own! Please fill out the entry form below for your chance to win. This giveaway will stay open until Thursday November 29th. Good Luck!!! I'd have to go with the classic... The COZY COUPE! 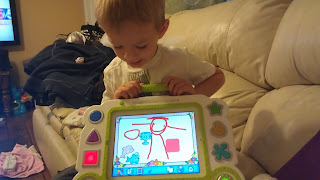 We love the Little Tikes art easel. My son loves his basketball hoop! The kids love the little tikes play house. And I love that it's the perfect size for them!